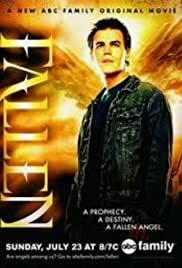 On Aaron Corbett's 18th birthday, he begins exhibiting strange abilities, such as the ability to talk to his dog, Gabe, and other animals, leading to the conclusion that he is a Nephilim, the offspring of a human and an angel. Now Aaron must defend himself and his family from the Powers, warrior angels dispatched to Earth to eliminate the Nephilim "abominations", while trying to find a way to live a normal life. He is befriended by Ezekiel, an eccentric but kind-hearted fallen angel, and the former leader of the Powers, archangel Camael. It is revealed Aaron is the Redeemer of prophecy, a Nephilim with the ability to "redeem" the fallen angels and return them to Heaven. After a battle with the Powers, resulting in the apparent death of Ezekiel, Aaron leaves his adopted family and joins Camael in order to fulfill his destiny.